Posted on Wednesday, April 15th, 2009 at 11:35 am by Eugene Starostin. 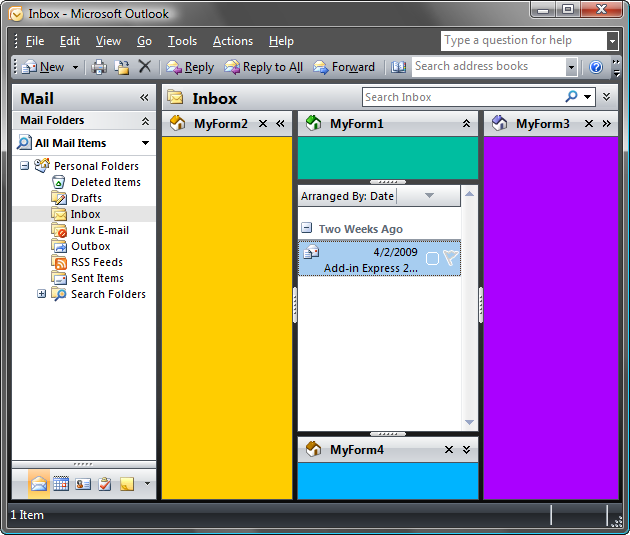 My previous post was about what the Advanced Outlook Regions really are. And now I will show you all possible variants of regions for two main Outlook windows – Explorers and Inspectors. In this post, there will be a lot of pictures and little text. As usually, all the forms that I am going to demonstrate do not have a single control. At the very beginning of their history, the Advanced Outlook Regions were totally based on the Microsoft Office 2003 terminology, that is why you may find some discrepancies in the names of the regions supported at that time and in the more recent regions’ names. The point is that in those, in fact, not very old days nobody could fancy that Microsoft would release their version of regions and would call them Outlook form regions. 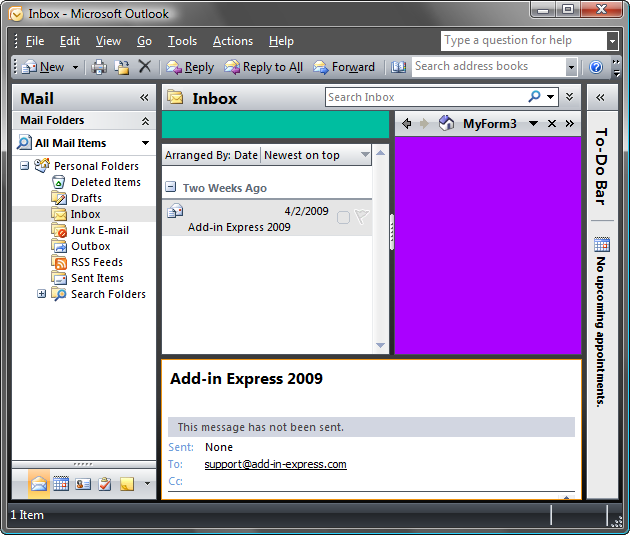 Then two nouns were used in the description of the Outlook windows elements – panes and subpanes. 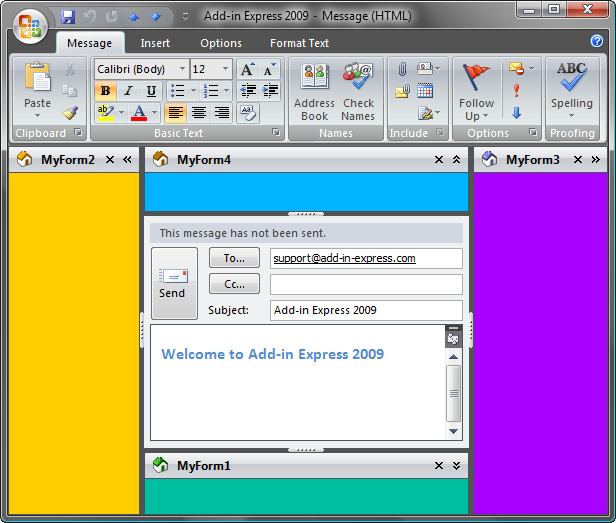 For this reason, beside the pictures I will give the specific name of the region, which is used in the ExplorerLayout and InspectorLayout properties of the Add-in Express Outlook Forms Manager component. 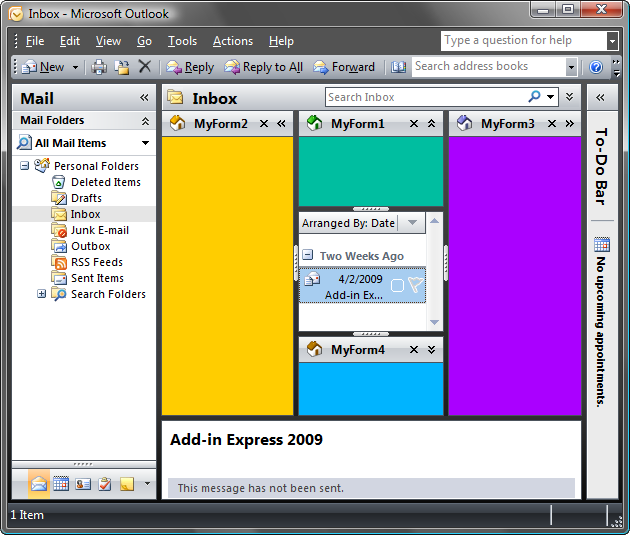 To denote regions that can be created in the Outlook Explorer window, we use two interchangeable phrases – “Outlook Explorer regions” and “Outlook view regions”, even despite the fact that the View pane (an area containing, for example, a grid with e-mails in mail folders) is just a part of the Outlook Explorer window. For regions in the Outlook Inspector window, we employ the same approach and use two interchangeable phrases – “Outlook Inspector regions” and “Outlook form regions”. You will find more details about each of them below. Let’s start with four regions located around the View pane. Here are their names according to the ExplorerLayout property: LeftSubpane, TopSubpane, BottomSubpane, RightSubpane. In these names, you can notice an evident terminology of the Office 2003 times. These are their names for the ExplorerLayout property: LeftReadingPane, TopReadingPane, BottomReadingPane, RightReadingPane. 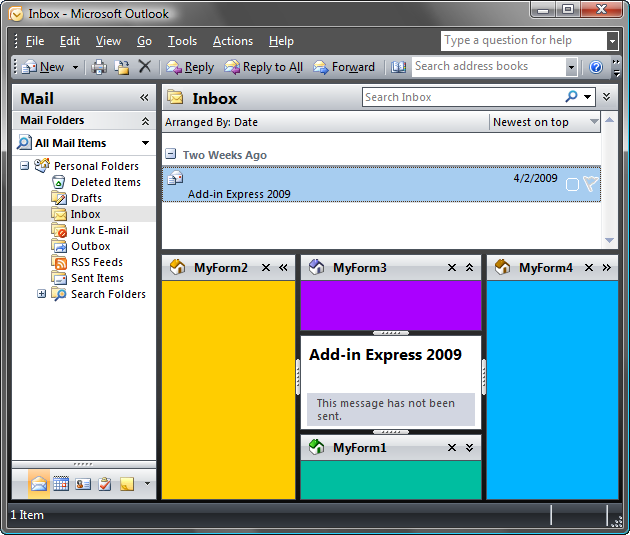 Both the Outlook Navigation Pane and To-Do Bar (oh yes, and Outlook Bar in Office 2002) can be hidden or minimized. In this case the regions that they contain will be hidden. WebViewPane is the name of one more region from the ExplorerLayout property. The WebViewPane region totally replaces the content of the View pane (the region is based on the folder home pages). The most frequent use of the region is to replace some folder’s view with its form. 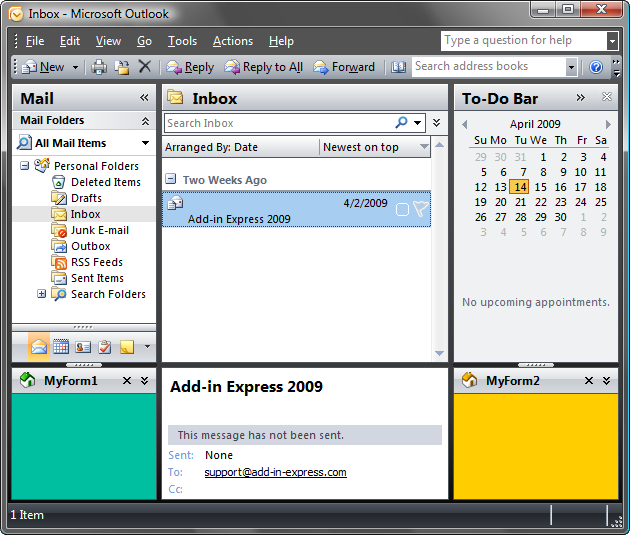 In principle, when using this solution nothing prevents you from hosting any application into Outlook, allocating its interface into the folders created for this occasion. 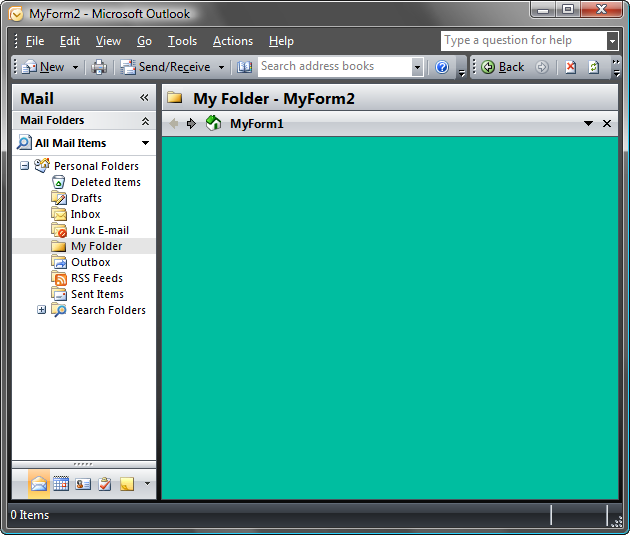 The best examples of such applications are Outlook Business Contact Manager and Outlook Client for Microsoft CRM.